Here's the rationale. What makes the current moment so intractable is that we've bolted bits of direct democracy onto a representative system, with no clear rules for how the two work together. It is perhaps not a coincidence that the prime minister responsible for managing this cyborg is so often described as robotic. The referendum is the most obvious problem: a narrow but decisive vote for an extremely unclear outcome, which in law was merely 'advisory' but as a political fact has become a kind of constitutional law, impossible to overturn except, maybe, by the same means. In the meantime, Parliament has the tricky task of discerning its meaning without actually challenging it, like the priests at Delphi. We've been using referenda with increasing frequency over the past few decades, without ever really thinking about how they work, so it was probably inevitable that one would turn around and bite us sooner or later. I suspect we'll be more careful in future. But the referendum is only one part of the problem. Another part of the constitutional doomsday machine we've built for ourselves is that both of the main political parties (plus the little ones too, like my own Lib Dems, but who cares) now have leaders chosen by the mass membership of the parties, not by the MPs. Like a referendum, this sounds obviously 'democratic', though party membership is a pretty odd demos. But in a parliamentary system the consequences are bizarre. Parliament is supposed to be sovereign: and yet MPs can have a leader whom most of them see as unfit imposed on them by their parties. Labour - which has long had an element of mass-membership choice in leadership elections, but which has now moved to do so exclusively - finds itself completely unable to resolve this clash. The Tories' situation isn't much better. Their MPs can at least defenestrate a leader, but they currently don't dare do so for fear of the candidate the membership might impose on them. Since Hague introduced the current system in 1997, having been embarrassed be being elected by MPs alone, the Tories have had four new leaders: twice the MPs have in effect conspired to deny the members a choice by leaving only one candidate standing, and on one of the other two occasions the membership's choice was disastrous. I humbly suggest that this system does not work very well. The natural next step in this de-parliamentarisation of our political parties is for some of them (the Lib Dems might do it) to consider having a leader who isn't an MP at all. That takes us into the territory of Poland's Law and Justice, where parliamentarians are in effect dictated to by an outside figure who never has to face a mass electorate. That would be bad. The best argument ever made for Brexit was parliamentary sovereignty (yes, yes, irony, I know). If MPs can be trusted to make laws, they ought to be trusted to choose their own leaders. By all means give party memberships a more active role in selecting or deselecting individual MPs. But once they're there, they have to be able to organise themselves as they see fit, or we will wind up with our cyborg constitution being managed by zombie parties. On wise and foolish ways to win wars: two further cases from British history which seem to me analogous to our Brexit woes. First: the English Civil War. In which the insurgents, who had been sniping from the sidelines but thoroughly excluded from power for a generation or more, suddenly found themselves leading an attempted revolution, forced on them by the rash behaviour of the posh bloke heading the government, whose previous experience of handling a crisis in Scotland mistakenly led him to think he knew how to handle things. They stumbled into the battle without much of a clear plan, and were badly divided amongst themselves over strategy and tactics. Arguably, that is why they won: their cause could be all things to all people, who could at least agree that they were rejecting the previous regime in the name of restoring some distant golden age. But this division is why they then go on to lose the peace. The new establishment wants a sensible compromise, a readjustment of the political structure which will be recognisably a variant on what’s gone before. But the war was actually won by the hardliners and the wild men, and they will not now accept half measures. In the short term, their ability to hold the new government to ransom means they win. For eleven years, they succeed in leading the country into their new utopia. But the Restorers never go away. In the end, the Scots march south and the country is won back surprisingly suddenly and peacefully. And the experiment remains a political fable for centuries. A rump of irreconcilables lament its passing, but it is never tried again. A Remainer fantasy? Maybe. But it is worth remembering that the eleven-year timescale is probably wrong. Things move faster nowadays. Secondly: the Second World War. Long before the outcome of the conflict is known – even when it still looks very likely that the enemy will win – the British establishment begins to think about more than just victory and defeat. Yes, it wants to crush toxic nationalism and to restore the old international order, but it also properly confronts the fact that a return to the status quo ante is not enough. It begins the job of seriously considering what British society might look like if and when, one day, the battle is won. Reimagining health care, the economy, education, welfare and all that may seem like a distraction, or an act of presumption. Surely all our efforts should be on the present conflict, not on dreams of what we might to do one day if we win? But this is wrong, for two reasons. First, if victory does come, and it might come suddenly, it is important to know what to do with it if we ever intend to entrench it. Second, what better way to spur the population on to that victory than by making it clear ‘victory’ will not mean a return to the 1930s? I am warier of that one, since it implicitly casts Leavers as Nazis, and I really, really don’t mean that. But those of us on the Remain side have been too focused on the day-to-day fight. There is still a distinct possibility that we will win: either that a new referendum will reverse Brexit, or that a Returner government of some shade will take us back in before too many years have passed. Creative planning for how our second era of membership of the EU will be different from the first wouldn’t just be responsible contingency preparation. It would help to bring that second era to pass. So, an English government falls unexpectedly as its plans for reconciliation with Europe collapse. Power passes by default to the last woman standing, who finds herself leading an uneasy regime in which her supposed allies – the radicals who are most firmly committed to a clean break with the Continent – don’t fully trust that she is on their side. It soon becomes clear that she has a very distinctive political style: to delay; to postpone difficult decisions for as long as possible; to suppress any discussion of the topics which she does personally not wish to address. For a great many of her subjects, especially for those who are instinctively her allies, this is first frustrating, then infuriating, then intolerable. The country is facing potential catastrophes, as it seems to them, and she will not acknowledge the fact or face up to the scale of the emergency. Does she not know that events are sliding towards catastrophe while she does nothing? Or does she not care? Some of those allies lose their cool, speak their minds, and are frozen out of power as a result. Others keep their heads down and keep quietly plugging away. Slowly, slowly, over time, as the evidence of real and potentially mortal danger becomes unmistakable, they manage to drag slivers of concession out of her one by one. At last, a crisis comes along that she is unable to dodge, she is forced to make a choice, and in the end she does what all the sensible people around her have been urging her to do for as long as anyone can remember. Her reward for this is permanently to be cast as a villain in the romantic narratives which lament the impossible, lost dream she killed. Yes, I admit it is a tasteless comparison. Elizabeth I was being pressed to cut off her cousin’s head; Theresa May is merely being pressed to rule out a no-deal Brexit. But the sense of existential crisis is not entirely different. 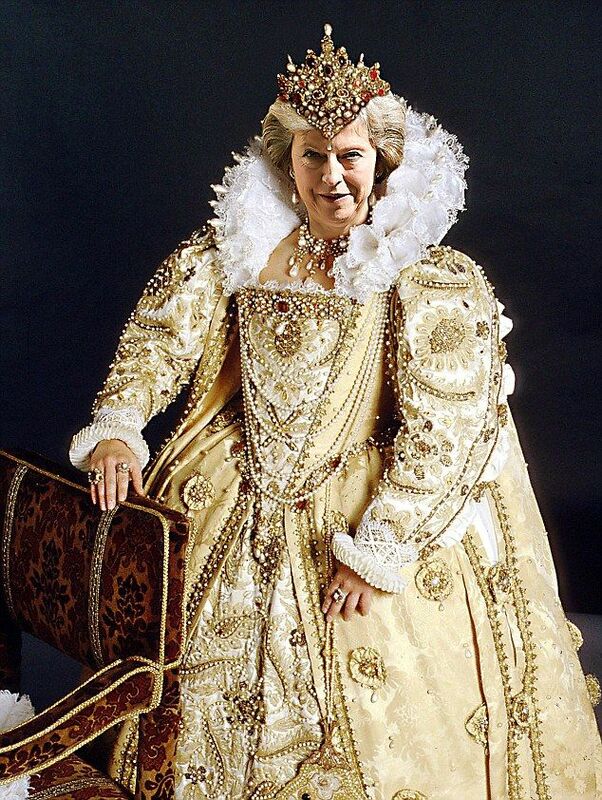 I am no fan of Mrs May’s style of government, nor, it should be said, of Elizabeth’s. But especially since Mrs May has made the comparison herself, I wonder if it might be instructive, even as some of her party have become increasingly apocalyptic about what they see as the vacuum of her leadership. Delay, postponement and inaction are intensely annoying as political techniques, but they can work, and not just because occasionally, if you wait long enough, something turns up. Importantly, a delayer is risk-averse - sometimes pathologically so, it is true - and this makes her susceptible to pressure. She will be much more likely in the end to take the less dramatic option in order to keep the boat afloat than to go down valiantly with her ship. And if in retrospect everything works out more or less all right – if the worst disasters are avoided, albeit the glorious hopes remain unfulfilled too – then she may win some grudging respect and even some nostalgic affection. Especially if, as seems entirely likely, she has a successor who infuriates us all so much that we decide we want to blow up Parliament entirely. Sorry about the title. Couldn’t resist it. Actually the shades in John Gray’s Seven Types of Atheism are pretty dark. He will upset quite a few people, and is not very sorry about it. The reader might be forgiven for imagining that this is an anti-religious polemic, but far from it. Gray is certainly an atheist – so much so that he does not regard religious positions as particularly intellectually serious or worth engaging with. His brief, by-numbers section debunking Christianity is one of the few disappointing bits of the book: I have a hunch his publishers might have told him he’d better put it in. He means it – for sure! – but it's not what's stoking his fires. His real targets are inadequate or flawed atheisms, and he has plenty to choose from. The result is an engagingly malicious travelling circus of atheism which puts a plague on every house it visits. Virtually no-one escapes. He has a handful of admirable figures, most of whom surface in the final two chapters. ‘There is something refreshing in Schopenhauer’s nastiness’ (for Gray, that counts as a compliment). Spinoza comes out of this pretty well too, along with Santayana and Joseph Conrad. The real enemy here is not religion, but ‘contemporary atheism’, which he sees in its various forms as ‘a continuation of monotheism by other means’. ‘Secular thought,’ he insists – with ample evidence – ‘is mostly composed of repressed religion.’ Above all, atheism has repeatedly claimed to transcend Christianity’s ethical framework before proceeding to ‘simply regurgitate some secular version of Christian morality’. Even those who have tried hardest to break out of that framework have failed. Nietzsche gets an hon mensh for efforts in this regard, but Gray sees him in the end as ‘an incurably Christian thinker’. Watching calmly as others drowned in misery, the Epicureans were content in the tranquil retreat of their secluded gardens. “Humanity” could do what it pleased. It was no concern of theirs. Now Gray is a philosopher and that’s the sort of thing philosophers do, so, fine. But from a historian’s or a social-scientist’s point of view, this is not a view which is going anywhere. Withdrawing to the margins is, by definition, a marginal position. We can all enjoy watching Gray taking an intellectual scythe to contemporary fallacies, but that neither explains them nor uproots them. If contemporary atheism’s greatest failure is its failure to transcend theistic morality, surely that tells us something: namely, that contemporary atheism is largely a moral critique of theism mounted in theism’s own terms. (As Dominic Erdozain has argued.) Of course it can’t transcend theistic morals: those morals are its whole basis. It is in the end an ethical revolt, which is with immense moral seriousness sawing off the branch it sits on. It is telling that one of the handful of modern thinkers to emerge from this book virtually unscathed is C. S. Lewis – not for his fiction or his apologetics, but for his ‘prescient’ exposé of transhumanism’s self-cannibalism in The Abolition of Man. Gray leaves you with two options. He recommends his own brutally honest, Lucretian withdrawal, which abandons morality as we conventionally understand it, along with any notion of ‘humanity’ (a particular bugbear of his). Alternatively, ‘anyone who wants their morality secured by something beyond the fickle human world had better join an old-fashioned religion’. Well, if you insist. My usual practice with a new issue of JEH is arbitrarily to single out one article, but this is a special occasion. Since I took up the co-editorship in 2014, one of our concerns has been to balance out our coverage of the global history of Christianity. We are very strong on European and especially British history, which is wonderful, but there is more to the subject than just that and we’re hoping to encourage historians with a different geographical focus to think of us for placing their best articles. So amongst various other things, we decided to launch a prize, running parallel to the longer-standing Eusebius Prize for early church history. The World Christianities Essay Prize of £500 (partly sponsored by the estimable Cambridge Centre for Christianity Worldwide) is awarded to the best essay on any subject relating to the history of Christianity outside Europe and North America since the year 700. Naturally we expect that the majority of submissions will concentrate on the last couple of centuries, but we are very open to early items too. Anyway, we ran the competition in 2017 for the first time, had a very pleasing 14 entries, and the five-member panel agreed to award the inaugural prize to Pedro Feitoza for his essay on the Imprensa evangelica, a Protestant newspaper in Brazil which ran from 1864-92. It’s a lovely piece on how Brazil’s tiny Protestant minority managed to insert itself into the public sphere and present a particular, modern image of itself during crucial decades in Brazilian history (covering, amongst other things, the abolition of slavery, a subject on which the Imprensa evangelica remained deliberately silent until the debate was almost over). That first prize essay is now in print in the July number of the Journal. Just as pleasing is the fact that it was a close-run thing. Two other outstanding essays were serious contenders for the first prize, both of them due to appear in forthcoming numbers – Laura Rademaker’s study of the Catholic mission to the Tiwi islanders off Australia’s north coast (or, as she would have it, of the islanders’ mission to their Catholic priests), and Jason Bruner’s article on hearing voices in the East African Revival. Either of them could have won. And while I’m enjoying myself, I think I also notice an uptick in general submissions with a global outlook – I’ve not seen the stats for the current year yet so I may be imagining things, but it looks that way to me. BUT ... one thing is inescapable: the submission rate for the 2018 prize (the result will be announced soon) was quite sharply down. So please, anyone who is interested in getting a prize on their CV and £500 in their pockets, and also with helping the Journal achieve our noble purpose, get writing. The deadline for the 2019 prize is 31 March. I would like to emphasise to anyone who ever has or who ever might submit an article to JEH that we apply the most rigorous and even-handed methods of blind peer review and level-headed assessment of papers on their academic merits. Any rumours to the effect that we use a form of sensationalism bingo to choose the papers that we publish are entirely and categorically untrue. It is therefore wholly coincidental that the April number contains an article which includes Jewish converts, the Ukrainian Hetmanate, nuns who insist they need ‘meat and men’ and who hold ‘noisy drinking parties’ in their cells, the phrase ‘several bucketfuls of wine’, and a punch-up in which (depending on which account you believe) either a drunken convent servant broke into a nun’s cell, beat her up and dragged her half-clothed across the yard, or he politely reprimanded her for her violation of discipline only to be attacked by several unruly stick-wielding nuns. Liudmyla Sharipova’s article 'Of Meat, Men and Property: The Troubled Career of a Convert Nun in Eighteenth-Century Kiev' went through exactly the same process of careful review and revision as any other piece. There is no denying, though, that she has a weird, grotesque and riveting tale to tell, and I will avoid any spoilers as to how these various elements fit together. What I will say is that the conflict that erupted around the nun and convert from Judaism named Sr Asklipiodata in Kiev in 1776 is more than just a compelling story. It is a window on a world of fluid religious identities and of monastic practices that are still scarcely known in the West, and it forces us to re-evaluate what we think we know about monasticism. One reason her story matters is that Ukraine in the late 18th century was one of the last outposts of an old style of religious life: non-communal, or ideorrhythmic, monasticism. In this system, monks and nuns bought their own cells, which could be openly luxurious, and which could be sold on or even inherited; traded on their own account; and were entitled to a share of the community’s produce. They continued to observe a common liturgy and share a burial ground, but this was not monasticism as we think we know it. You might think, indeed, that it was simply a form of corruption and that these communities had become in effect secular economic entities. But the pleasure of Sharipova’s article is that she lays bare the conflicts which ideorrhythmic living could produce while still having a lively, humane awareness of the genuine but of course tangled and compromised spiritual life that was led within this structure. My apologies for sensationalising this piece. Sharipova herself resists that temptation (although to be fair, the material doesn’t need much help); and the lasting impressing the article leaves is less of a dramatic story than of an extraordinary, combative, assertive, vulnerable and unexpectedly pious woman, who had spent six tumultuous decades ploughing her own furrow and was not about to submit meekly to a newly arrived mother superior. She deserved a memorial. I am pleased that, in a small way, she now has one. One of the most obvious of the many problems with the lazy science vs. religion stereotype is how many eminent scientists have also been exceptionally earnest in their faith. I knew Robert Boyle, perhaps the key founder of modern chemistry, was one of these, but until recently I didn't know the extent of this. He was decisive in the republication of the Irish-language New Testament in 1681-2, and of the first Irish-language edition of the Old Testament in 1685: the driving force behind the twin projects, and also their indispensable financial sponsor, sinking well over £300 and perhaps as much as £700 of his own money into them, not least because of his insistence that the books should be given away to those who would benefit the most. In the genre of epistolary excuses, that one is hard to beat. And he will have smoothed over any disappointment, since he guessed - correctly - that the letter was asking him for more money, and so he sent it anyway. *Robert Boyle, The works of the Honourable Robert Boyle (ESTC T004460. London: for A. Millar, 1744), vol. V p. 611.